Please note that the content of this book primarily consists of articles available from Wikipedia or other free sources online. 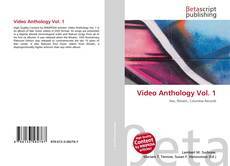 Video Anthology Vol. 1 is an album of Nas' music videos in DVD format. Its songs are presented in a slightly altered chronological order and feature songs from all of his first six albums. It was released when the Illmatic: 10th Anniversary Platinum Edition was released to commemorate the last 10 years of Nas' career. It also features four music videos from Illmatic, a disproportionally higher amount than any other album.